When you make a selection in an image in Photoshop, then paste the selection to another image or background, very often youâ€™ll find (when itâ€™s placed on a different colored background) a stubborn ring of pixels around your initial selection. This is known as an edge halo, fringing or matting. Hereâ€™s a fairly extreme example. 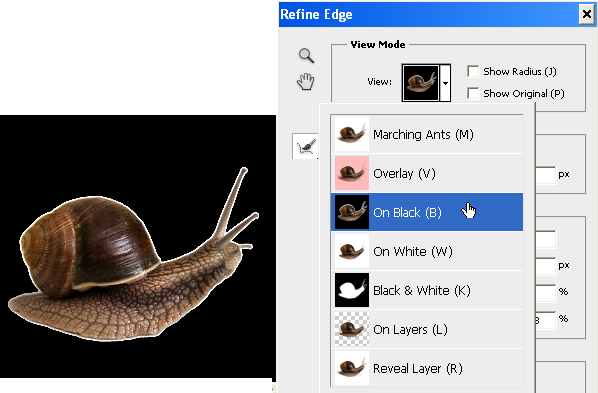 The snail was selected on a white background and pasted onto the dark red background. We can clearly see the white halo. This sort of thing is a problem for web designers. If you want to have an object sitting on a colored background you need to remove that edge halo, but itâ€™s close to impossible to do it well using an eraser, so how do you get rid of it ? Well as is often the case with Photoshop, there is more than one way to skin a cat. Hereâ€™s three options. When you make your initial selection on the original image use the Refine Edge dialog box (this gives you a preview) or choose Select > Modify > Contract to contract your selection. Use this technique while you still have the marching ants showing your selection. Using the Refine Edge sliders you will be able to get a much better selection. You can use this command after you delete the background (it doesnâ€™t work on layer masks or while a selection is active). 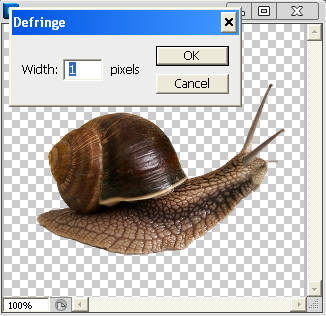 Make your selection, then delete the background, then choose Layer > Matting > Defringe and enter a value in pixels. Photoshop analyzes the active layer and replaces the color of the pixels around the objectâ€™s edge with the color of nearby pixels. For example, if you enter 2 px, itâ€™ll replace a 2-pixel rim of color all the way around the object. If your halo is simply black or white, Photoshop can remove it automatically. After youâ€™ve deleted the background, select the layer with the object of interest on it and then choose Layer > Matting > Remove Black Matte or Remove White Matte. Like the Defringe command, this doesnâ€™t work on layer masks or while you have an active selection.